The Surgeons are delighted to announce that they have managed to tempt the legendary TV Smith back to Penzance on November 19th 2016 to play a gig at the Sailing Club. The Surgeons will be providing the support on what promises to be another memorable night. Lifejackets will be supplied. The Surgeons, after a period of reflection have decided to reform. A small number of select gigs will be undertaken in 2016 with more bookings to be undertaken in 2017. Please e-mail the band if you would like to see the Surgeons perform in your town. festival, they will head over to Manchester for a gig with the Bus Station Loonies on Monday 27th May at the Star and Garter . The Surgeons recently played on the same bill as the Bus Station Loonies and the Subhumans at Falmouth. The Surgeons are pleased to announce a warm up gig for the Nice n Sleazy festival on Thursday 16th at the Studio Bar Penzance. The gig will feature fans first opportunity to see Trevor on bass in 2013 who is standing in for the Colonel. The Surgeons are pleased to announce the honour of being the first Cornish Band to play " the" major punk festival, Rebellion in Blackpool. The event takes place 8th -11th AUGUST 2013 - WINTER GARDENS - BLACKPOOL - UK. The line up is unbelievable with pretty much every major punk band in the Uk playing . The Surgeons are pleased to announce the release of a new EP- "Beer & Books" available at the bargain price of £2.50, available online from this site or at gigs. Selling fast and in limited supply, get your now. The Surgeons have returned from Morecambe , to date the greatest distance we have travelled to play. Due to circumstances beyond our control, our gig in Redruth on the 16th June 2012 has been postponed, we hope to have some news for all Redruth fans shortly. Our original gig in Blackpool tomorrow has been cancelled but we have re arranged to play at the Misery of Sound at the Music Hall Tavern- Hope to see you all there. The Surgeons are warming up for their tour up North with an appearance at the Studio Bar Penzance. on Friday 27th April 2012. From 10 until Late. It'll soon for time for the Surgeons to head up the motorway to the northern territories. 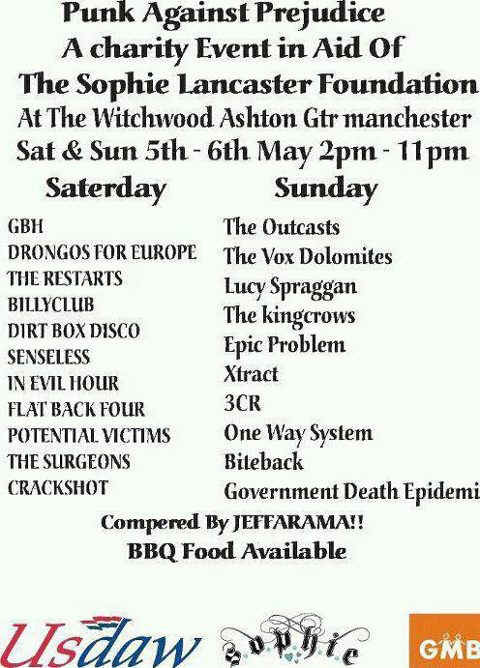 Friday the 4th sees the Surgeons supporting Potential Victims & Wasted Life at Talbot Rock. Blackpool. The next day they head over to Manchester for the Punk Against Prejudice event.